If you're reading this, odds are you have made the very important decision to improve your health by undergoing weight loss surgery. Hats off to you—it's no small feat and could very well have saved your life! While your surgeon provided you with the tool to assist you in losing weight, making that tool work is up to you—and that's where this sensitive and authoritative guide comes in. In Weight Loss Surgery Cookbook For Dummies, 2nd Edition you'll find the fail-safe, easy-to-follow guidance you need to make smart, informed choices as you adopt a healthy eating regimen to your lifestyle. Packed with 100 plus delicious recipes, healthy recommendations, the latest information on grasping the ingredients in your food, expert tips on meal planning and shopping, and so much more, you'll find everything you need to safely keep those pounds coming off post-surgery. 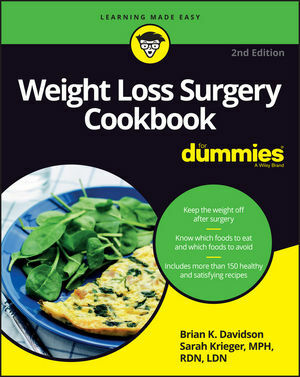 Brian K. Davidson is the coauthor of Weight Loss Surgery For Dummies. Sarah Krieger, MPH, RDN, LDN is a registered and licensed dietician.